VATICAN CITY (CNS) — The saints were Christians who were “crazy for concreteness,” knowing that faith is not an idea, but a relationship with Jesus, which leads to actions that demonstrate love, Pope Francis said. Celebrating morning Mass Jan. 7 in the chapel of the Domus Sanctae Marthae, the pope said the celebration of Christmas is the celebration of a faith that is concrete. Christians profess their belief that “the son of God came in the flesh, became one of us,” he said. “He was conceived in the womb of Mary, born in Bethlehem, grew like a baby does, fled to Egypt, returned to Nazareth, learned to read with his father, to work” — although God, he was also truly human. 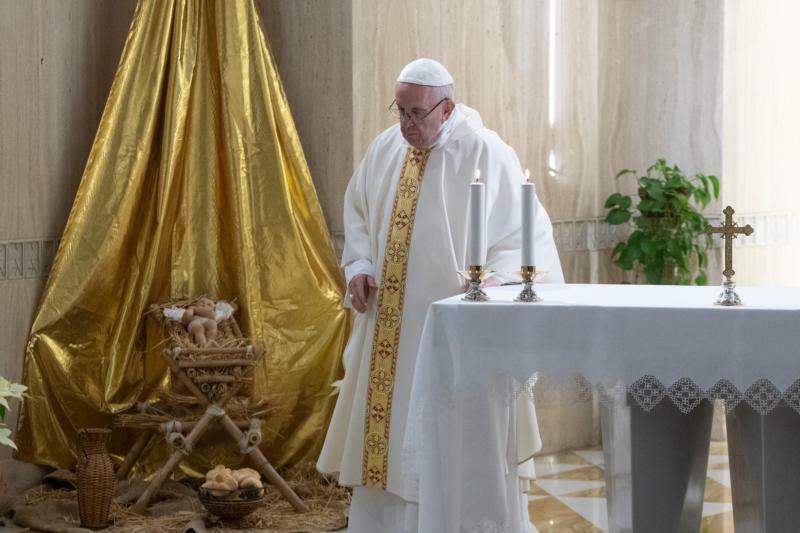 The first reading at Mass was a passage from the First Letter of John, which says Christians are commanded to believe in the name of Jesus and love one another, with “concrete love, not a fantasy love,” the pope said. One way to grow in the art of spiritual vigilance, he said, is to “take two, three, five minutes” at the end of each day to ask where God was at work and what God seems to be speaking to one’s heart.